The Defence Minister Kevin Andrews has paid tribute to the role of the Bible in times of conflict, describing it is a source of “great comfort and solace”. Mr Andrews was speaking at the Victorian launch of Their Sacrifice which he and his wife attended today before flying out to France tomorrow for a week of ANZAC Day commemorations. Mr Andrews acknowledged the work of Bible Society in providing Bibles to chaplains who then pass them onto defence personnel. “Chaplains are important because ultimately all of us ponder the question of the meaning of life,” he said. 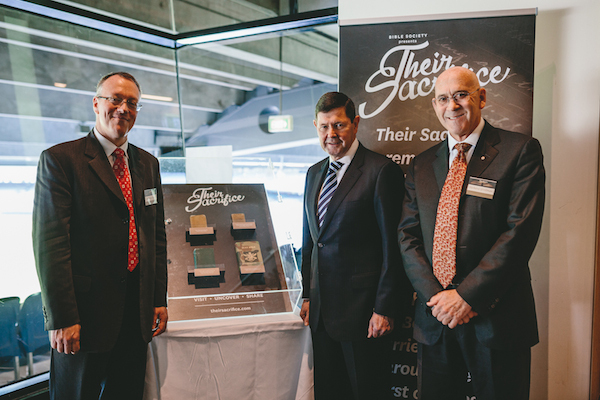 Joining him at the launch at the MCG were former Victorian Premier Ted Baillieu and AFL personality and coach of Essendon, Kevin Sheedy. 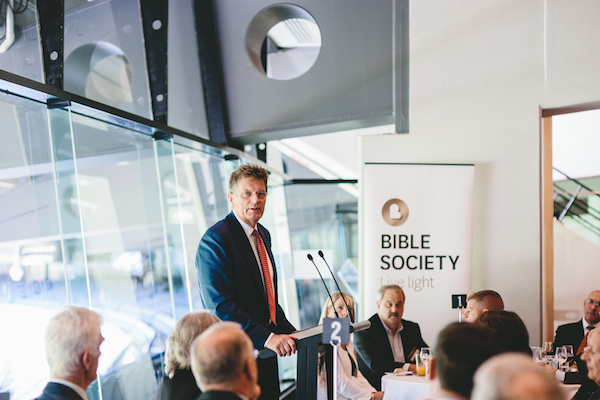 Mr Baillieu is the Victorian ANZAC Centenary Committee Chair, and said Bible Society’s work is more enduring than the ANZAC legend. Those present heard how Bible Society will tour the country with an interactive multi-media display which will be housed at Westfield Shopping centres across the country. CEO of Bible Society Australia Greg Clarke said Their Sacrifice provides an opportunity to remind the Australian public of the important legacy and impact the Bible has had on society. 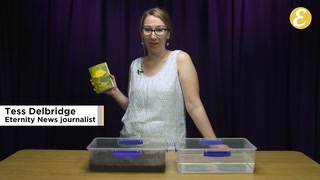 He said it was significant how many of the Bibles given to the Bible Society for safekeeping were from times of war. The Rev. Charles Vesley who is a serving chaplain in the defence force and just returned from Afghanistan is one of the men whose stories is shared as part of Their Sacrifice. He told those gathered how God is working even now among defence personnel, sharing a story of a young atheist soldier who the night before a particularly dangerous operation asked for prayer saying his Gran had told him it was good to pray. 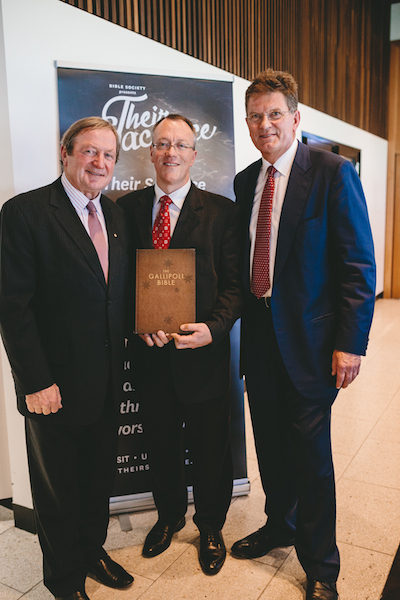 Each of the speakers was presented with a limited edition Gallipoli Bible, published by Bible Society Australia especially for the 2015 commemorative events. After receiving his copy, the Defence Minister Kevins Andrews said if he were to be re-elected at the next Federal election he would swear on the Gallipoli Bible at the official swearing in ceremony.